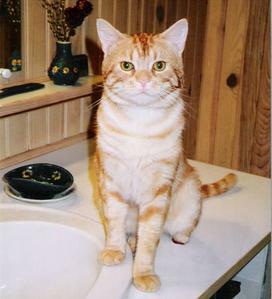 In June 2003, RouXy’s left rear paw had to be amputated. About 10 one morning, in a barn at the bottom of the lane, on the roadside, a steel-jaw trap imprisoned RouXy for twenty-four hours, stopping bloodflow. 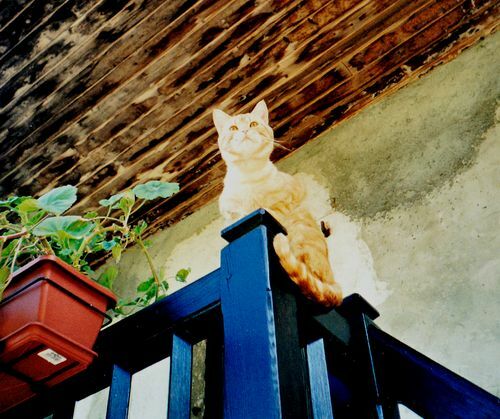 Last photo of four-legged RouXy on our balcony a few minutes before the accident. First photo with his stump below. The gangrenous stump had to be treated for at least two months, a very painful treatment. RouXy never scratched nor bit. This entry was posted in Non classé and tagged amputation, gangrène, paw on 14 February 2017 by Le Maitre de Frimousse.